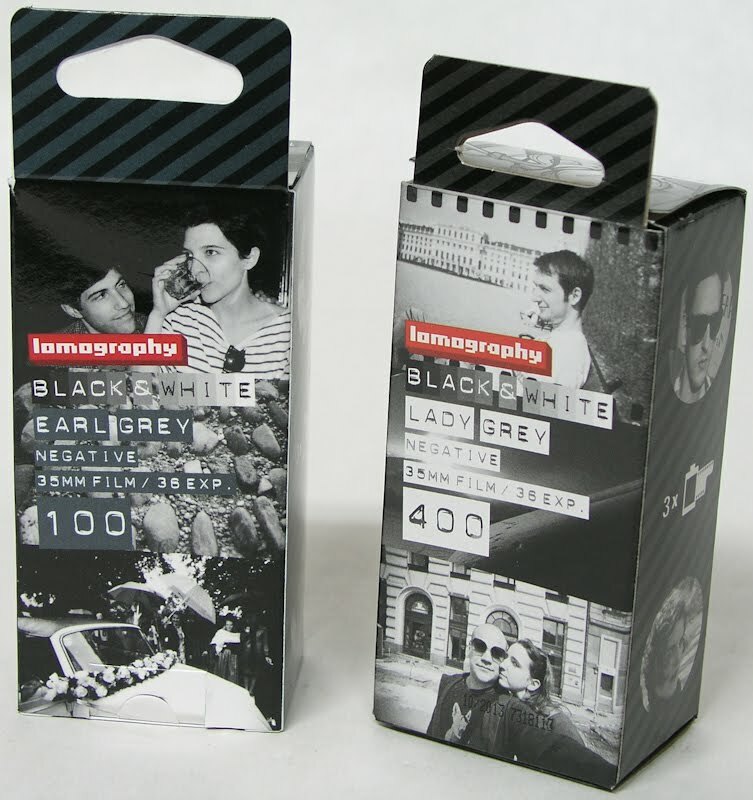 Last month, I received an e-mail from a Lomography representative, asking if I was interested in writing something about the two new films being offered under the Lomography label -- "Earl Grey" and "Lady Grey." I offered to test the films and write up a short review about them. But first, let me preface this review with some comments about the Lomography brand. There are those people that completely dismiss Lomography as being some sort of cultish fad that preys on the hipster crowd. There are others that drink the Lomography cool-aid and have no idea about other aspects of photography. I think most people are somewhere in between. I give the Lomography folks credit -- they have found a way to promote film cameras and film usage to a younger crowd that has grown up in the digital age, and along the way, have inspired some of this young talent to use film and embrace the concept that fim is a versatile and creative tool. Their products ARE fun - there is no doubt about that, and they have marketed their brand very well. Lomography has brought back plastic cameras such as the Diana, and improved on the original design. The company has come a long way from starting out as a subculture of Euro-centric film nuts, united with their love of the LOMO LC-A camera. Flash forward to 10 years later, and Lomography products are in stores, catalogs, and of course, on the web in a big way. The growth of their brand has increased as the usage of film has gone down. So, despite some of the criticism leveled at Lomography, I think it's fair to say that the company has helped keep film alive, and introduce a new crop of young photographers to "analogue photography." Of course, there will be some bumps in the road, but hopefully, my concerns below will be addressed. Okay, I promised a review, and not a history lesson. The package with the two boxes of film arrived -- and there were two 3-packs of 36 exposure film! One was the Earl Grey - ISO 100 black & white film, and the other was the Lady Grey ISO 400 black & white film. I'm not sure how they came up with these names, but I suppose someone thought it sounded cool. Of course, there are not new films, nor are they made by lomography. Both films are repackaged b&w film made by other companies. I'll get back to that under the review of each film. My tests are made using the film in my typical shooting routine. EARL GREY - This film is 100 ISO, and the box indicates that it is made in the Czech Republic. From that, I deduced that it is Fomapan 100 film. I don't think I have ever shot with any 35mm Foma films, but I have used their 120 in the past. I loaded the film up in my Nikon FM2N and shot an entire roll in Dexter, MI one morning. ISO was set at 100. I used a 50mm f/2 Nikkor - the standard lens. I developed in Kodak Tmax RS developer. LADY GREY - This appears to be Kodak T-Max 400, as the package indicated that the film was made in USA and packaged in Mexico. The pink tint to the anti-halation layer is a good indication that I am right, as are the typical Kodak film cans. I also used the FM2N, same lens, as well as a 28mm f/2.5 Vivitar and a 105mm f/2.8 Nikkor lens. Some images were shot in Dexter-Chelsea area and many shot in Fenton, MI a few days later. The rolls I shot were also developed in Kodak T-Max RS developer. The edge markings merely have "B&W 400" along the film rebate. Since both of the films tested are standard b&w films, there really should be no surprises in the testing. I think the Earl Grey is a bit contrasty - at least in the developer I used. I'll try Rodinal the next time and how that compares. I felt that the negatives were somewhat overexposed, but again, maybe it's the developer choice. The Lady Grey was very good, with minimal grain and no surprises. It looks like a T-grain film. All of the negatives were scanned using my Minolta DualScan II with VueScan software, and levels adjustments were made in Paint Shop Pro on my Dell running Windows 7. Either one of these films will be a good choice for general photography, and I'd be more apt to go with the Lady Grey, just because of the extra speed. However, if the Earl Grey is supposed to be a contrasty film, it should be good for those wanting a more vintage look to their images. I imagine it would be great for someone wanting to shoot "Bettie Page" type photos. One catch here -- since these are true B&W films and not C-41, Lomography needs to provide an obvious web address to link to developing information. There are enough opportunities for novices to think that they can just take anything to the corner CVS/Walgreens/Target and get it developed. Imagine their shock when the equally clueless lab tech develops the film in the C-41 chemistry and a blank roll results. Not a good way to encourage people. I could not find ANY developing information on the Lomography web site on my own, and the Lomography rep sent me the links when I inquired -- which are really buried in their site. So, Lomography PLEASE make a better effort to (A) ensure that novice users do not mistake these films for C-41 monochrome and (B) print a web link on the boxes of film so that home developers can find the times and recommended developers. Until that is done, nobody is going to know what to do with their Earl Grey or Lady Grey film after it has been shot. I do recommend that photographers look at the Digital Truth site for the Fomapan 100 and T-Max 400 films. Now, it could be that because Lomography has given the above films their own names, it's not impossible that another manufacturer might be used, in which case, they would hopefully update their web site with the proper processing information. 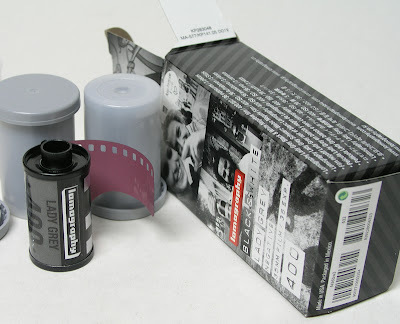 Lomography might be the only way for some folks to try out traditional b&w films; but for the unknowing, the packaging should say (THIS IS NOT A C-41 FILM!). In any event it's a way to get a few rolls of b&w at local outlets or via internet/mail. Have some Earl Grey hot, or Lady Grey cold, and give traditional monochrome films a try. Sorry, not my cup of tea. I'd rather bet my biscuits on film from ILFORD! Thanks, Erika. Glad that you are enjoying it! A couple of comments. Firstly, if the ISO 100 film is Fomapan it should have a blue tint and when you develop it the developer will come out with a strong blue tinge. Secondly, BW 400 is indeed a Kodak Pro film, but it isn't TMax. More importantly it is actually designed to be developed in C41 process so if it really is that film then your point about development is only valid for the ISO 100 film. Thanks for the review though, very informative! Sorry, you are wrong about Lady Grey -- it is Kodak T-max, as it has the same develop times and anti-halation as T-max -- it is most definitely not a C-41 film. You can check the Lomo website. And yes, it IS Fomapan for the 100 ISO. After having developed over 1000 rolls of B&W, I think I know my films. Just a follow-up -- the Earl Gray film does really well in Rodinal 1:25, and the negatives came out great for the second roll. Lady Gray in T-max developer is wonderful, which is how it should be. Thanks for confirming my suspicions on both of these (Earl Grey = Fomapan & Lady Grey = TMax400). I wanted to develop Lady Grey using Ifosol3, which wasn't on the chart provided on the Lomography site. I used the incomplete developing info charts on they provided, sat down with my laptop and the Massive Dev Chart database, and worked by process of elimination. Based on the developer times they DID provide, I found that the times for Fomapan100 and TMax400 lined up best to those short lists. Well, you may think that, but you overlook the fact that the film is made in the USA., and the ilford film is made only in the Uk. Second, I know Delta 400 is T-grain film, so it will have a similar grain structure as T-Max 400. Third, the dyes used in T-max are different than Delta 400. Now, knowing that LOMO can source their film from anywhere and call it whatever they want, means that they could change the source. However, check the spot on the box where it says where it was manufactured, and you will have a clue. After having gone through thousands of rolls of B&W, I am pretty confident in my statements. I enjoyed your post and agree with your observations on Lomography as an organization. I have used both the 100 and 400 speed films and am generally happy with the results. I prefer Ilford FP4 and HP5, but that is close to impossible to get via retail where I live. The fact I can go into a hipster store like Urban Outfitters and get fresh BW or 120 film, yet there are no pro camera shops within 40 miles of where I live is pretty ironic. I suspect that they reused the film cans, so go by what was printed on the label, not what was underneath it. Thanks for this article and every one's comments. I have a few rolls of Lady Grey that I want to develop, but didn't know what to look it as on my film developing time chart. Can't wait to get started. A point about Ilford (Harman) and third-party labels: Ilford has stated that they will not allow any “re-badging” of Ilford or Kentmere-branded films. They will, however, manufacture films to a specification provided by a third party for sale under the third-party label, for example Agfa APX and Rollei RPX films, both made in the UK (at the moment). No current Lomography films are therefore made by Ilford, but it is not beyond possibility that at some time in the future, they may be, if Lomography can come up with a b&w film specification of their own. Thank You for excellent post on these two films. Your assessment of the distributor is very much my own. I shot the 120 variation Earl Grey and the package also was the Czech Republic. So I assume this is Foma. I developed it in Tanol Speed a Pyro based developer. The film was badly fogged and the the emulsion curled; hard to load (kinks in emulsion Grrr) and mount for scanning. I'm currently considering 35mm bulk film emulsions and Foma bulk has a good price. The 120 experience has put me off. HAve you made any PYro with Foma? Opinions etc?